Pink magnolia tree in bloom in October-November instead of January as usual. What a crazy year this has been weather-wise. We didn’t get enough heat this summer for my summer or winter squash to produce any fruit. At least I guess that was the problem. Now we’re getting the heat. The thermometer broke records in LA yesterday and the day before, 96 F and 98 F respectively. Some of my jade plants are blooming. They normally bloom in January. 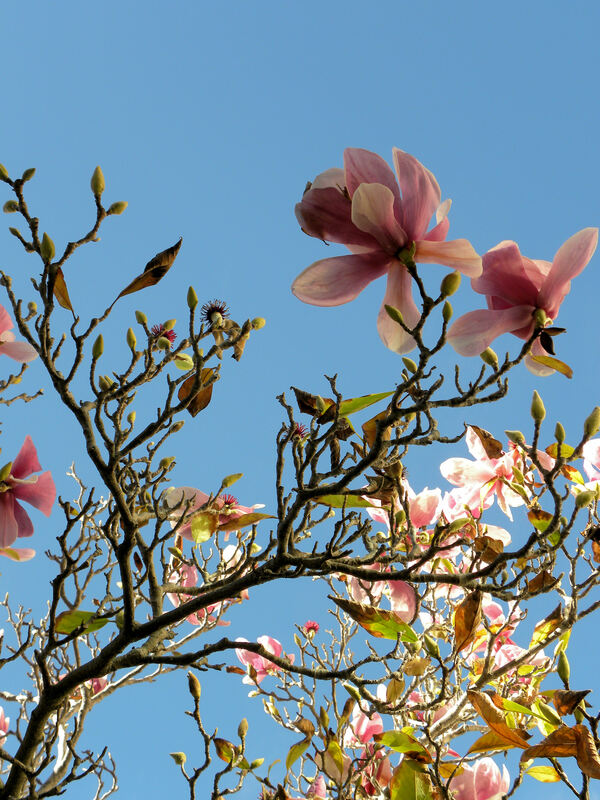 My pink magnolia tree is in full bloom before it has shed its leaves. It normally blooms in January. My Thanksgiving cactus bloomed in Sept/Oct and is finished already. It normally blooms Nov/Dec. Some of my snow drops and paperwhites have bloomed. Others are just now breaking through the ground. Nature has gone haywire. 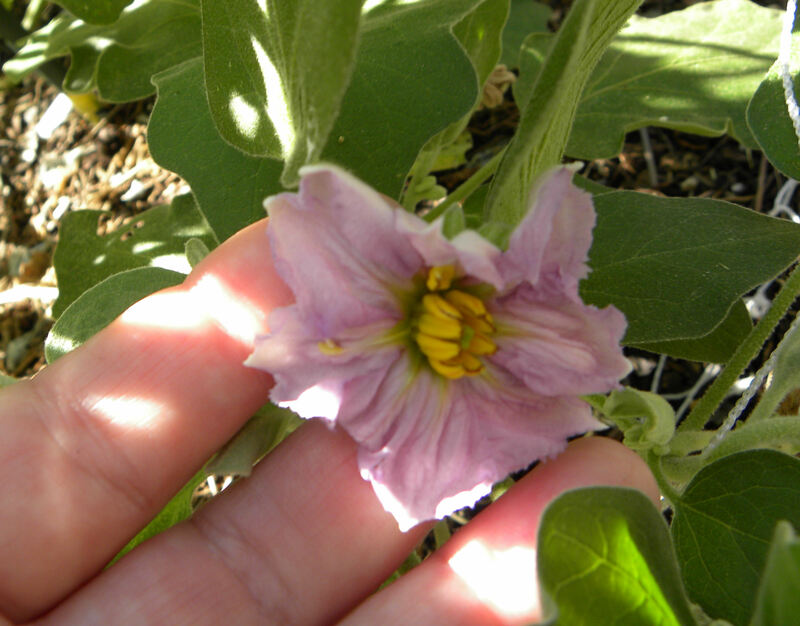 My Black Beauty eggplants, which didn’t produce a thing all summer, are just now coming into bloom. Some of my tomatoes are still blooming. Ditto the bell peppers. Crazy. 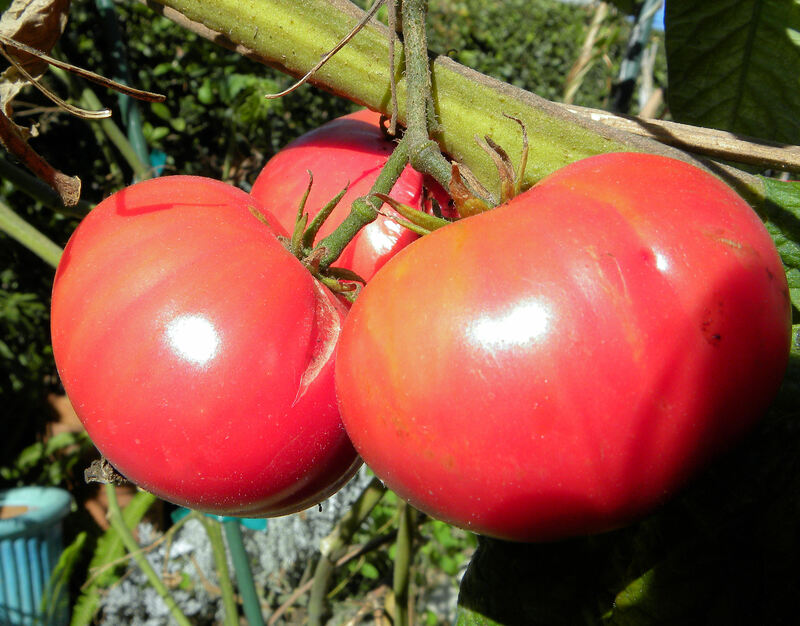 The Brandywine tomatoes, which were the last of my varieties to bloom and set fruit, are still producing. Newly transplanted strawberries wilting in the heat. A fellow gardener gave me some strawberry plants and irises that she was throwing away due to lack of space in her garden. I had to transplant the strawberries immediately, despite the record heat. The result was wilted plants. The rate of evapotranspiration was greater that the ability of the traumatized roots to take up moisture. 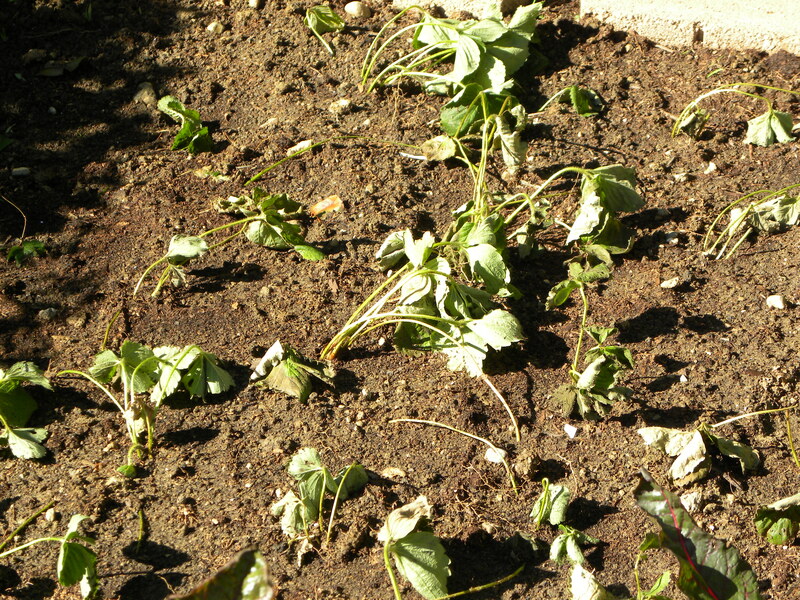 I’m trusting that they will recover as the plants were sturdy and healthy. 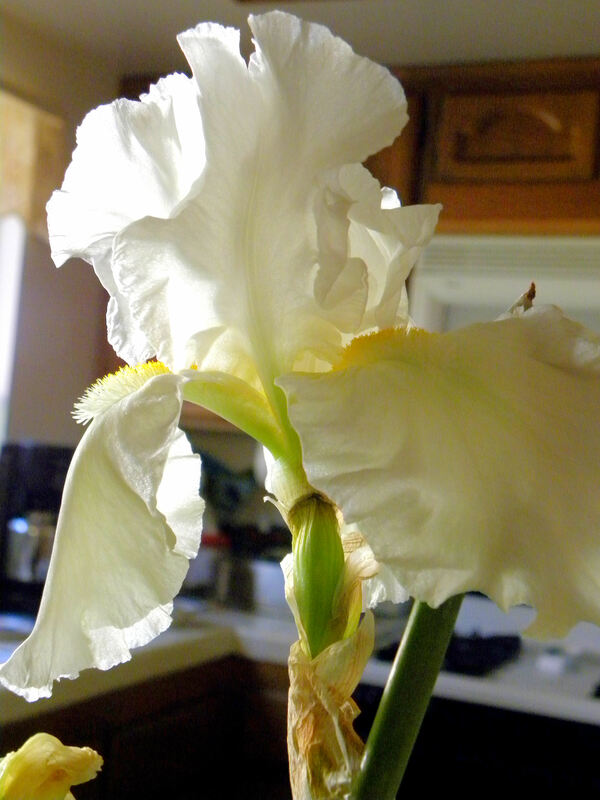 I’m postponing planting the iris for another day or two until the weather cools back down to normal for this season. And that’s the way the planet warms. Not with a bang, but a whimper. A few record hot days here and there, and fewer record lows. It isn’t even and it isn’t consistent. But it sure messes up the plants. The plants are less able to ward off disease and insects. 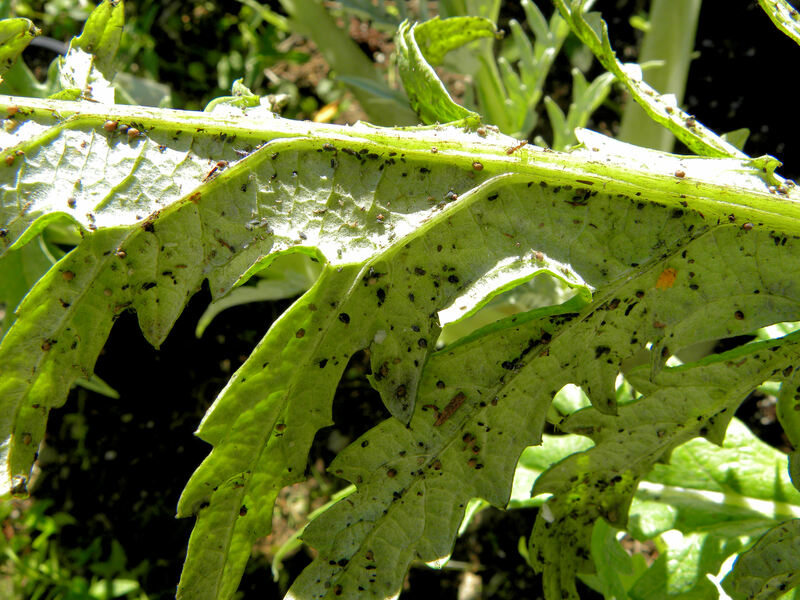 I’ve sprayed my artichokes three days in a row with a heavy stream from the hose, and yet the aphids persist. I’m going to use NEEM next and hope that I can save them. With global weirding, fruit trees bloom off-schedule. Then they can get caught in a cold snap and fruit set is lowered. My navel orange tree set very little fruit. Then the crazy thing bloomed again in late summer, something I haven’t seen before. Only a few of those blossoms set fruit. My strategy to combat global weirding is to plant a wide variety of crops and stagger my plantings as best as I can in my tiny garden. I also do whatever I can to reduce use of fossil fuel. Keep those carbon emissions down. And I’ve planted as many trees as I can fit into my yard, as well as in restoration projects around the county in my work with the Orange County Conservation Corps. The first nine months of this year were the hottest since 1998, which holds the current record for hottest year. The planet is warming, slowly and irregularly, but it’s still warming. The Arctic is warming more than the temperate zone, and for reasons that I don’t understand, that makes weather colder in the winter for places like New England and the upper Midwest. It isn’t just global warming, it’s global weirding. For all of you out there making your own compost, growing your own food as much as possible, eating vegetarian meals at least some of the time, installing solar electric panels, and driving a hybrid car or riding a bicycle, thanks. We all need to do whatever we can to reverse the accumulation of carbon dioxide and methane in the atmosphere while there is still time. Once the feedback mechanisms kick in, like melting of the permafrost and release of clathrates from the deep ocean, we’re done for as far as having the kind of stable climate that allowed civilization to develop over the past 10,000 years. I hope that there is still time to reverse what we’ve done. This entry was posted in Uncategorized and tagged Arctic, artichokes, clathrates, climate change, compost, Fruit, global warming, permafrost, southern California, vegetable garden. Bookmark the permalink. 2 Responses to Record heat in LA, global weirding! We had an errant two days of unseasonably warm weather here this week too. I peeked under the row cover, and discovered all of our California Early White garlic has sprouted! Good thing we also planted heat tolerant Late White. I didn’t expect a heat wave in November, especially after this summer. Staggering planting, and planting bolt/heat tolerant varieties of vegetables may have to become the norm in our future fall plantings. Global wierding indeed! On the upside, your tomatoes still look great! Thanks, Clare. I still have 8 or 9 tomatoes left on the vine. I am hoping against hope that the flowers will set fruit with this hot spell, so I didn’t cut the vines down this weekend. The hot spell seems to have done in my fall planting of lettuce though, so I’m going to have to replant. Pooie on Global Weirding.